Be sure to pack that swim suit because we have a feeling you’ll want to take a dip in one or more of these spectacular Disney Value Resort pools. Five Value Resorts with a total of 12 pools… let’s begin the “all you need to know” about the Value Resort Pools. NEED TO KNOW – Towels are not available at ANY of the Value Resort Pools so plan to bring one from your room or pack one for your trip. Also, don’t go looking for a spa (hot tub) while staying at a Value Resort, as they are not available at any of these properties. Take a swim in what feels like a time machine back to the 1960’s! The Hippy Dippy Pool is all about the 60’s flower power with their flower shaped pool and water jets. Bright in color and staying true to the Pop Century theme, we love this feature pool for its unique appearance and large size (over 235,000 gallons!). Shade is hard to come by unless you arrive early enough to snag a table with an umbrella. Kiddie Area: Located just behind the Hippy Dippy Pool, the kiddos will surely spot the kiddie pool that offer zero entry and water fountains. Leisure Pools: Enjoy 2 leisure pools at Pop Century. The Bowling Pool is cleverly shaped like a bowling pin and has a fun 1950’s theme. Check out the jukebox machine and massive Tramp from the Lady and the Tramp movie! The Computer Pool is themed after the 1990’s. At this pool you’ll spot a giant keypad and floppy disk. Much like the Hippy Dippy Pool, arrive early for a shade umbrella. You can’t miss the vibrant Petals Pool Bar next to the Hippy Dippy Pool as it matches the flower power theme! This full service bar is the perfect place to enjoy a tropical drink, beer, wine, cocktail… or whatever your drink of choice may be. 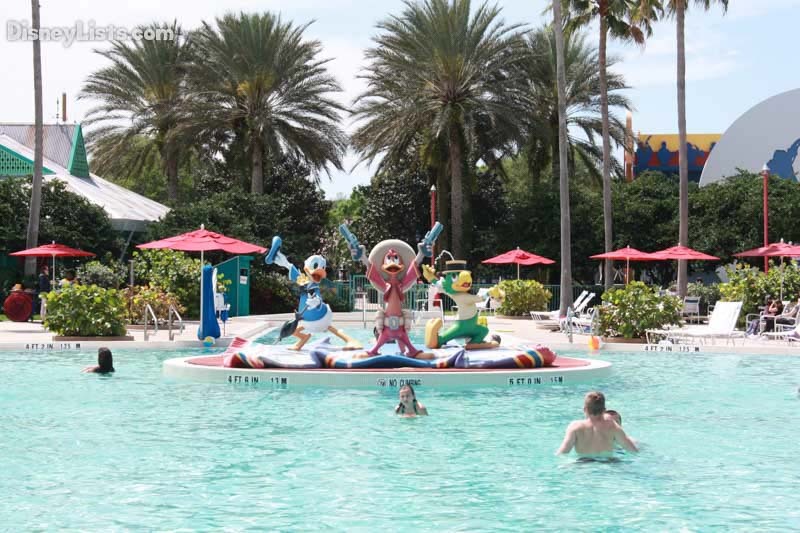 The Calypso Pool features some of our favorite characters – the Three Caballeros! Right in the middle of this guitar shaped pool, you’ll spot the colorful Three Caballeros fountain featuring Donald Duck, José Carioca and Panchito. The grand palms do provide some shady spots, but for the most part you’ll want to find an umbrella location if you are seeking a shady retreat. Kiddie Area: The kiddie pool is at the top of the Calypso pool guitar handle. Somewhat square in shape, this is a simple kiddie pool but does the trick for cooling off the little ones. Leisure Pools: The second pool at All-Star Music is the Piano Pool. Shaped like a grand piano, this pool is not as large as the Calypso Pool but is a great place to take a dip and relax! Looking for a beverage to unwind with by the pool? Singing Spirits Pool Bar has you covered with their full bar selection of drinks. Ready for a trip to the beach? You’ll be feeling like you’ve reached the ocean when visiting Surfboard Bay Pool. You can’t miss the giant, colorful surfboards near this wavy shaped pool. The grand palms not only provide a little shade, but they also match the theme of the pool beautifully. Kiddie Area: The kiddie pool near the Surfboard Bay Pool is a simple spot for the kiddos to enjoy a refreshing dip of their own. Leisure Pools: Take me out to the ball game… or well, to the Grand Slam Pool! This leisure pool is shaped like a baseball diamond and features Goofy as if he was pitching from the mound – but instead pitches a stream of water. Check out the huge baseball bats and Coca Cola cup! It is a “grand” stand alright! Take your pick of specialty drinks or go with your usual beer from this full bar near the Surfboard Bay Pool. If you are looking for a pool that exudes Disney magic – you’ll want to check out the Fantasia Pool. Here you will find the Sorcerer Mickey fountain welcoming guests to jump in for some fun! Shade is available but not as abundant as one would hope for so arrive early for a shady spot. Kiddie Area: Kids are welcome to splash around in the kiddie pool which is surrounding by ice blocks and located near the Fantasia Pool. The kiddie pool is set back away from the large pool so the kids really have their own defined space to play. Leisure Pools: Calling all ducks… Mighty Ducks that is – to the Duck Pond Pool which is themed after The Mighty Ducks film. The pool resembles a hockey rink with masks and hockey sticks. Tell your family to form the “Flying V” and jump in! You’re on vacation so why not pull up a chair at the Silver Screen and enjoy an adult beverage or two! 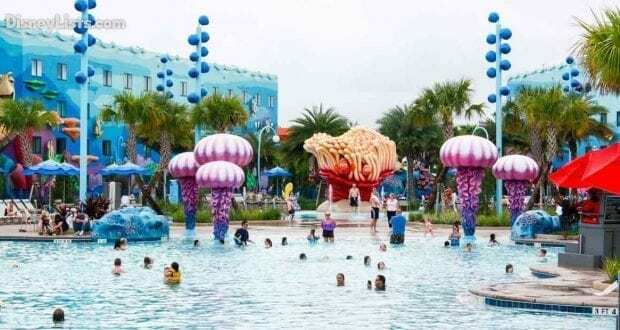 It’s a Big Blue Pool – and actually the BIGGEST hotel pool on Disney World property! This pool is spectacular and wins our hands down favorite of Value Resort pools. The massive turtle, Crush, from Finding Nemo is hanging out near the pool which is also surrounded by favorite Nemo characters, large jellyfish and so much more that seem to bring the Finding Nemo film to life! This pool even has underwater speakers so you can listen to your favorite Disney songs under water. Just incredible! Some shade is provided, but like the other resorts, seek out an umbrella location right from the get go. Kiddie Area: Also our favorite kiddie area as a Value Resort – check out the “Schoolyard Sprayground” located between The Big Blue Pool and the Righteous Reef Playground. Fun jets and fantastic, colorful Nemo characters surround the pool for a kiddo’s dream come true. Can you find Nemo? Leisure Pools: As if The Big Blue Pool isn’t enough for this value resort, Art of Animation also offers two leisure pools. The first one is the Cozy Cone which is straight of the movie Cars. Try to snag a cone for a fun shade experience and don’t forget to check out the life size creations of all your favorite Cars characters like McQueen and Mater! The second leisure pool is the Flippin’ Fins Pool. All sorts of fins are welcome at this Little Mermaid themed pool with Ariel and Sebastian as the stars! Do us a favor and drop us off at this pool bar please! Snacks, frozen drinks, specialty drinks, beer, wine, sangrias – they have it all at this full bar located just a few steps away from The Big Blue Pool. 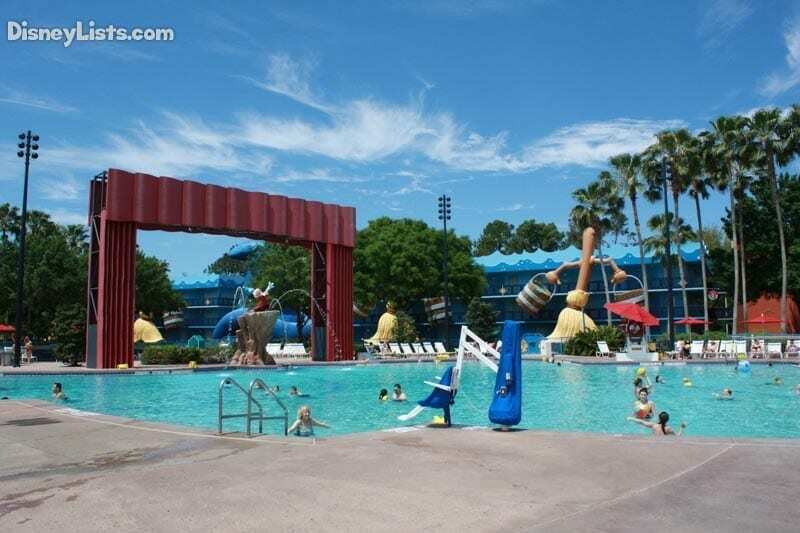 We hope you make a big SPLASH at your Value Resort pool on your next vacation to Disney World.